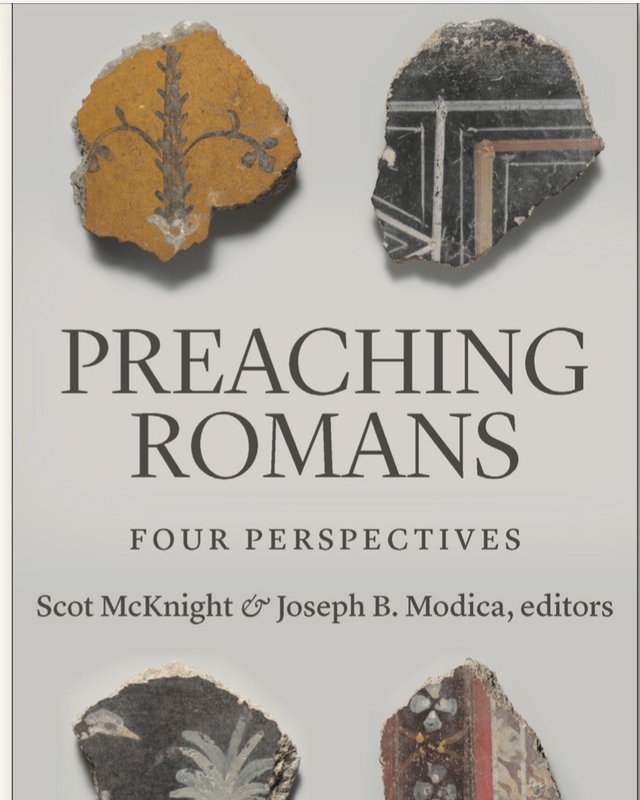 Eerdmans has published a collection of scholarly essays and sermons on Romans, including yours truly. I’m thrilled to be a part of a book that I’d likely have bought anyway, and I’m even more humbled to be grouped among mentors who’ve become friends. 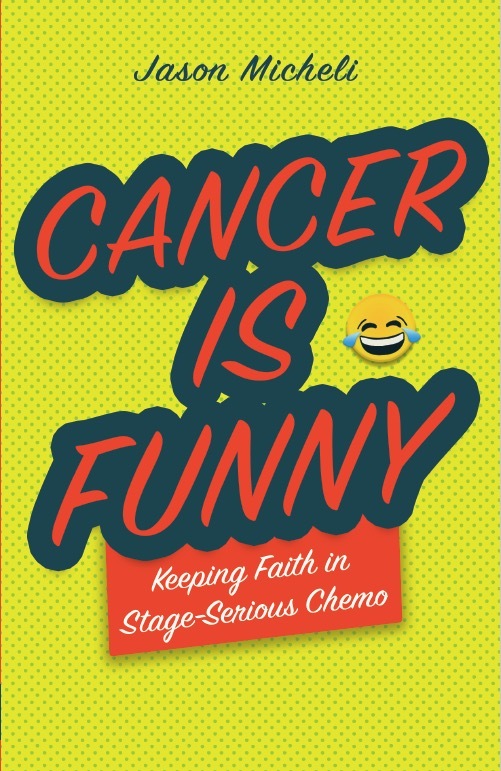 Here’s the official press on the book. here. For Episode 88, Kenneth Tanner and Morgan Guyton checked in with podcast favorite Scot McKnight. 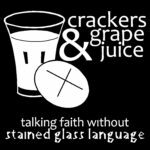 Topics covered include a little ribbing on me, politics, and Scot’s latest books, “Adam and the Genome: Reading Scripture after Genetic Science” and “The Hum of Angels: Listening for the Messengers of God Around Us”. Next week – Martin Doblmeier of Journey Films. Followed by Robert Jenson and Rod Dreher of Benedict Option fame. Stay tuned and thanks to all of you for your support and feedback. We want this to be as strong an offering as we can make it so give us your thoughts. This time in Roanoke, Oregon, South Carolina, Louisiana, Colorado, California. The 355th this year. While Americans get hot and bothered over the specter of an infinitesimal number of refugees fleeing to America from terrorism in Syria, we ignore terrorists of our own making. We watch the aerial footage of standoffs and the ticker tape death tolls scroll across our television screens as though it were all a Quentin Tarantino film. No, I can actually remember Quentin Tarantino movies: ‘I’m a mushroom cloud laying motherf@#@$r’ said Jewels to Vincent Vega on screen at the Genito movie theater in Midlothian, Virginia in the fall of 1994. Like long lapsed Catholics, we genuflect towards the terrible headlines, but we don’t actually bother to remember the tragedies. We note the place names and the dates and the numbers of victims with less investment than a boy memorizing the stats on the back of his Topps baseball cards. That is to say, we don’t give a damn. Wolf Blitzer may but we give less than a damn actually. We don’t do anything about it. We may be willing to shred the constitution when it comes to Muslims, but when it comes to guns we’re all either strict constructionists or we’re, worse, apathetic. On the left, we respond with resignation that nothing can be done. On the right, we respond with bumpersticker cliches (‘people kill people not guns’) and specious, apocryphal history (a militarized police and unstable individuals with automatic weapons is what James Madison wanted). I know what the emails in my Inbox will say: I’m reacting too rashly, too quickly. We don’t even know the details of this (latest) mass shooting. I know I’ll get gripes that I’m being ‘political,’ a transgression which pastors should never commit. However, none of the above should label me an anti-gun liberal. I’m, in fact, neither liberal nor anti-gun. That many of you still will label me an anti-gun liberal shows how silly the debate has gotten. Some of you will be irritated by what follows below. Fine. Whatever. B) completely in line with the official position of my denomination, the United Methodist Church. 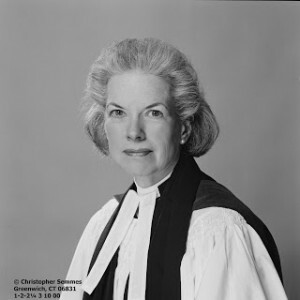 In America and Its Guns: A Theological Expose James Atwood, a Presbyterian pastor, makes a theological, as opposed to a political or constitutional, argument for safer gun restrictions. That is, it’s not a question of what’s constitutional, legally allowed or what the Founders envisioned; it’s a question of how we as Christians live as a peaceful alternative to State, placing our identity in Christ above all worldly loyalties. And its at the question of loyalties and priorities where Atwood makes his argument. While not disputing the 2nd Amendment, Atwood- ever a good Calvinist- argues that the problem at the root of the gun debate- the gun lobby specifically- is idolatry. 1. When an owner [of a gun] believes there are NO circumstances when a regulation or restriction for public safety should be placed upon it [the gun/the owner]. 2. When an owner believes that guns don’t kill; they only save lives. 3. When an owner has no doubt that guns preserve America’s most cherished values. Deep emotional attachment to guns. Anger when anyone questions gun values. When no preventive measures are supported. When little to no grief is shown for those who have experienced gun violence. When any restrictions of gun sales are vigorously opposed. When gun rights carry more moral weight than children’s safety. When people claim an absolute right to use their guns against the government if they consider it tyrannical. 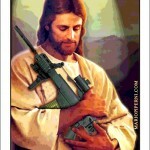 When people claim the blessing of God on the right to own a weapon. Because I’ve seen it so many times before- and so have you- I know what’s coming in the days ahead. Those on the left will demand we do something about gun violence but will do nothing about gun violence. Those on the right will point to the individuals involved and ignore the instruments by which they so easily wreaked their havoc. 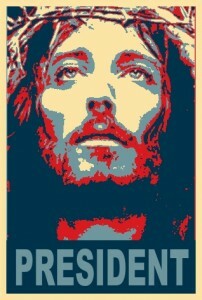 But, I’m pretty sure, not many people will be pointing to or pointing out our idolatry. Not many will be calling Christians out. So I might as well: is the sacrosanct nature of the 2nd Amendment proof that people of faith are more shaped by our national story than we are by our Gospel story? 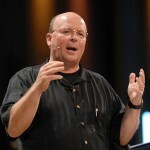 Scot McKnight is a friend of this blog, curates the Jesus Creed blog and is a New Testament Professor in Chicago. 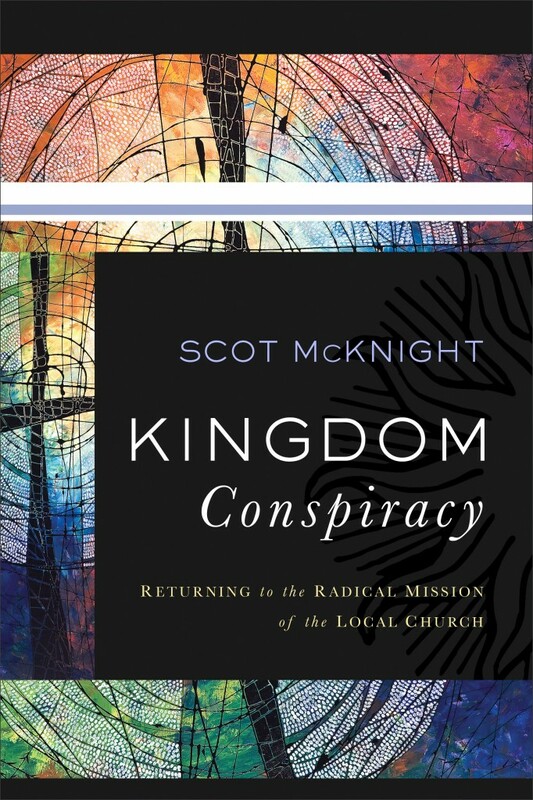 Scot is the author of many acclaimed books for both scholars and lay people, including the forthcoming book, The Kingdom Conspiracy: Reclaiming the Radical Mission of the Local Church. Scot will be our guest preacher next weekend at Aldersgate’s main campus. He will also inaugurate our new season of Pub Theology on Saturday evening- that’s this Saturday- beginning at 6:30 here. I invite you to check Scot for both opportunities. If you’re interested in Pub Theology, email me at jason@aldersgate.net as space is limited. 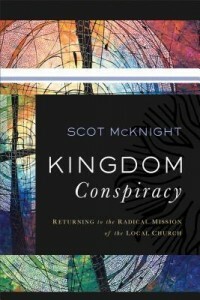 At all services and at Pub Theology we’ll have copies of Scot’s (not yet released) available for you. 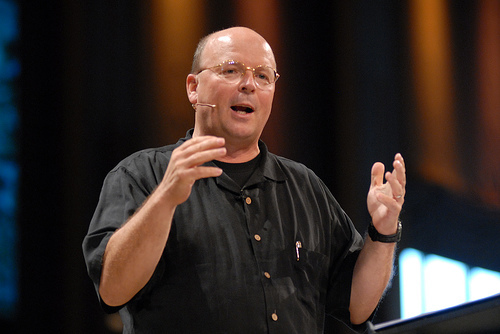 Scot McKnight needs no introduction to most Christians with an internet browser. 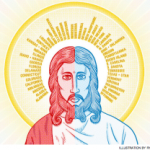 His Jesus Creed blog at Patheos is one of the top-trafficed Christian blogs on the web. Scot’s a professor at North Park Seminary in Chicago and over the years has become a friend and mentor. His book, the Death of Jesus, was ground-breaking in unpacking Jesus’ own self-understanding of his death in terms of the Passover. His more recent book, The King Jesus Gospel, is a must-read for anyone for whom the season of Lent and Easter is important. In it, McKnight methodically shows how what we so often define as the Gospel (Jesus died for you) is not the Gospel as the New Testament defines it. Be on the lookout for the next installments of the podcast. 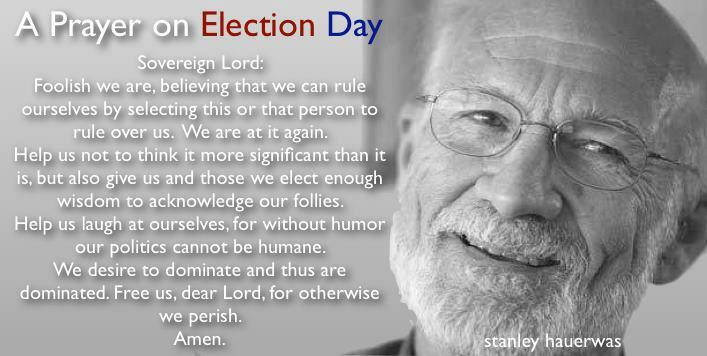 We’ve got Stanley Hauerwas, Ched Myers and Brian Blount in the queue. 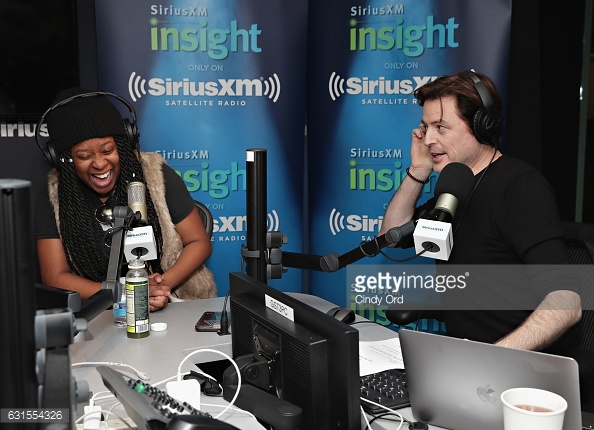 You can listen to the McKnight interview here below in the ‘Listen’ widget on the sidebar. 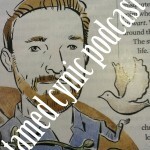 Better yet, download the FREE Tamed Cynic mobile app linked in the sidebar. Here’s the sermon from this weekend. I’ll post the video and audio from the sermon once it’s ready. As you’ll see below, I began with an updated rehearsal of Numbers 5 that’s better seen than read. Joseph has gotten short shrift in the Gospels, Church History, Christian Art and Preaching. 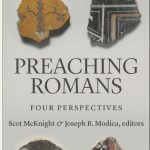 If you’d like to read more beyond the sermon, I’d suggest Scot McKnight’s book, The Jesus Creed, or Ken Bailey’s Jesus Through Middle Eastern Eyes: Cultural Studies in the Gospels. First, barley is measured out of its package- 2 quarts worth- and poured into an offering plate. Second, holy water is poured from the baptismal font into a large clay pitcher. Next, the ‘indictment’ is written on a piece of parchment and then its burnt, its ashes put into the water and mixed together. Then, the pen with which the indictment was written is unscrewed and the ink is poured into the pitcher of water. Finally the floor of the altar is vacuumed and the suctioned dirt is removed from the bag and put into the pitcher. It’s all mixed together a last time and poured into a clear glass. There’s something about this (the bitter waters) story, and there’s something about Joseph that always makes me think of my boys. But it’s not for the reason you might guess. Sure it’s true that Jesus isn’t Joseph’s biological son. It’s true that, like me, Joseph is an adoptive father. It’s true that in Jewish tradition as soon as Joseph names him and claims him as his own- adopts him- Jesus is as much Joseph’s child as he would be had Joseph been the biological father. And it’s true that I know firsthand how true that is and feels. That’s not the something about Joseph that always makes me think of my boys. And that’s all Matthew has to say. I know Matthew’s nativity sounds like a short, simple, straight-forward story, but that’s because we live on this side of Christmas. On the other side of Christmas it’s not a simple, straight-forward story at all. In Hebrew the term is ‘tsadiq.’ And it’s not just an adjective for someone. By calling Joseph a righteous man, Matthew’s not simply saying that Joseph was a good man or a moral man or even a God-fearing man. Tsadiq in Matthew’s day was a formal label. An official title. Tsadiq was a term that applied to those rare people who studied and learned and practiced the Torah scrupulously. Tsadiqs were those rare people who believed the Jewish law was the literal Word of God as dictated to Mose, and therefore, as the Word of God, tsadiqs believed the Torah should be applied to every nook and cranny of life. When Matthew tells you that Joseph was one of those rare, elite tsadiqs- righteous men- Matthew tells you everything you need to know to unlock this story. Because when Matthew tells you that Joseph was a tsadiq, he’s telling you, for example, that Joseph wore phylacteries, little boxes of scripture against his head and around his arm- as commanded in Deuteronomy 6. When Matthew tells you that Joseph was a righteous man, he’s telling you that Joseph wore a prayer shawl at all times as commanded in the Book of Numbers 15. A shawl with tassels hanging from every corner, each tassel a tangible reminder of all the commands of God. When Matthew tells you Joseph was a tsadiq, he’s telling you that Joseph had a long, never-trimmed beard, a beard that would fill me with envy, a beard that would set him apart as different and holy- just as Leviticus 19 commands. 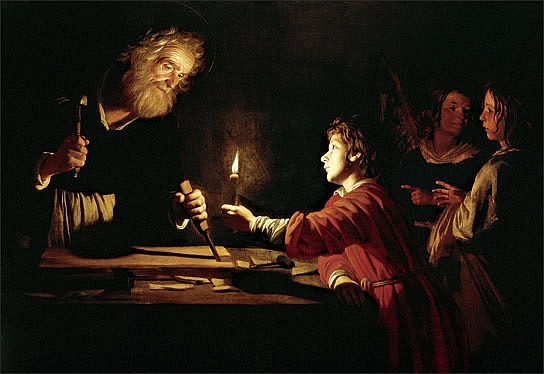 Joseph was a ‘righteous man,’ says Matthew. A tsadiq. Which means there were specific things Joseph did and did not do. And as a tsadiq, you can bet Joseph had a copy of this prayer rolled up and nailed to his doorpost. If Joseph was a tsadiq, then he gave out of his poverty to the Temple treasury. He traveled the 91 miles from Nazareth to Jerusalem every Yom Kippur to have a scapegoat bear his sins away. He practiced his piety before others to remind them that God had called them to be perfect, as God is perfect. Joseph was a righteous man, Matthew says. A tsadiq. Meaning, there were specific things he did and did not do. He did not violate the Sabbath, no matter what, because God created man for the Sabbath, for the glory of God. And as a tsadiq, Joseph did not eat unclean food. For that matter, as a tsadiq, Joseph did not eat with unclean people: gentiles or outcasts or sinners. When Matthew tells you that Joseph was a righteous man, he’s telling you that Joseph was one of the rare few who could be called ‘righteous’ because they lived the righteous law of God to the letter. If the Torah commands that you care for the immigrant in your land then a tsadiq does just that without questioning. And if Torah commands that you avoid and dare not touch a leper, then a tsadiq obeys God’s righteous law and keeps his distance. In Israel, in Matthew’s day, after being a priest there was no greater honor than being given the title tsadiq- a righteous man who follows every letter of God’s righteous law. Because this tsadiq is engaged to a woman named Mary. And he’s not the father- of course he’s not. He’s a tsadiq. You see, in Mary and Joseph’s day, betrothal was a binding, legal contract. Only the wedding ceremony itself remained. Mary and Joseph weren’t simply fiancees. For all intents and purposes, they were husband and wife. They were already bound together and only death or divorce could tear them asunder. For that reason, according to Torah, unfaithfulness during the engagement period was considered adultery. Actually, according to the Mishna– which is Jewish commentary on the Torah- infidelity during betrothal was thought to be a graver sin than infidelity during marriage. Matthew tells you that Joseph is a tsadiq. As a tsadiq, Joseph knows what the Torah now requires of him. Joseph can’t simply forgive Mary and forget. Only God can forgive sin. No matter how much Joseph might love Mary, his love of God must trump his love of neighbor- they’re not equivalent. According to the Book of Deuteronomy, Joseph must take Mary to the door of her father’s house, accuse her publicly of adultery and say to her: ‘I condemn you.’ And if she does not protest or deny the accusation, the priests and elders of Nazareth will stone her to death. On her father’s front porch. That’s what the Torah commands. And Joseph, Matthew tells us, is a tsadiq. A righteous man. Of course, if Mary does protest, if she denies that she’s sinned, if she’s foolish enough to tell people something as ridiculous as her child being conceived by the Holy Spirit then Joseph, as a tsadiq, certainly knows what course of action the Torah requires: the ritual of bitter waters. According to the Book of Numbers, Joseph is commanded to take Mary before a priest, bringing an offering of barley with them. About 2 quarts’ worth. After offering the barley upon the altar, the priest will compel Mary to stand before the Lord. The priest will pour holy water into a clay jar. Then the priest will sweep up the dirt from the synagogue floor and pour it into the jar of water. Then the priest will write and read out the accusation against her and Mary will be compelled to say: ‘Amen, amen.’ Finally the priest will take the accusation and the ink in which it was written and mix them into the water. And then command Mary to drink it. If it makes her sick, she’s guilty and she’ll be stoned to death. If somehow it does not make her ill, then she’s innocent. Her life will be spared though, in Mary’s case, her life still will be ruined because she’s pregnant and Joseph’s not the father. She will be considered a sinner. Specifically, an am-ha-aretz, a term that was reserved for people like lepers and tax collectors and shepherds. And as a tsadiq, someone who lives the Torah inside and out, Joseph certainly knows he’ll be considered an am-ha-aretz too if he marries Mary. He’ll be a tsadiq no more. On the other hand, if he does anything other than, anything less than, what the Torah commands he will be a tsadiq no more. He will lose his status as quickly as though it were emptied and poured out from him. But that’s what Joseph chooses to do. Matthew says in verse 19 that ‘Joseph resolved to…’ but Matthew leaves it to us to imagine just how long it must’ve taken Joseph to come to that decision. And it’s not like Joseph’s happy about it. It’s the same word Matthew uses in chapter 2 to describe King Herod’s anger at learning the magi have escaped him. It’s the same word Luke uses to describe how the congregation in Nazareth responds to Jesus’ first sermon right before they try to kill him. So it’s not like Joseph is happy about it. But still, Joseph decides to violate the Torah by refusing to condemn Mary. 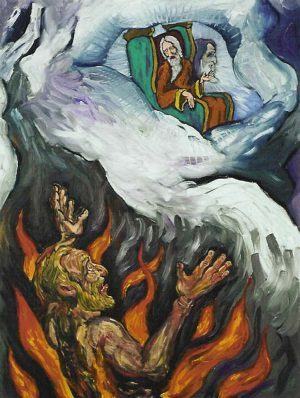 Joseph ignores his obligation as a tsadiq by refusing to have Mary’s guilt tested by the bitter waters. Joseph forsakes his power and privilege as a tsadiq for Mary’s sake, for a sinner’s sake. He decides to divorce her in secret. He chooses love over the letter of the law. He chooses compassion over condemnation. He chooses sacrifice over safety and self-interest. Joseph makes that choice before the angel Gabriel ever whispers a word to him. Joseph chooses this path before he finds out that Mary is anything other than exactly what people will assume she is. Flash forward 30 years or so. And the boy that Joseph made his own is all grown up. And one day Joseph’s boy meets a woman at a well. Jacob’s well. Even though it’s almost dark and Torah commands that they shouldn’t be talking with each other, especially at night, Joseph’s boy sits down next to her and does just that. The woman’s had 5 husbands and the man she’s with now, she’s not married to. Which, according to Torah, makes her guilty of adultery. According to Torah, she’s exactly the type of person who deserves to be given the bitter waters. But instead Joseph’s boy, who doesn’t even have a bucket, offers her something that sounds like the opposite of bitter waters: Living Water. And one day, Joseph’s boy is at the Mt of Olives and a group of experts in the law- tsadiqs- come up to him, carrying stones and a woman they’ve caught in adultery. And Joseph’s boy knows what the Torah commands. He can probably cite the chapter and verse: Deuteronomy 22. It’s not an ambiguous case; it’s a dare. Because he’s not clean, Torah is clear about that. And Torah is clear about commanding that Joseph’s boy should put as much distance as possible between himself and this leper. But instead Joseph’s boy reaches out to him and touches him and says to ‘I do choose.’ And Joseph’s boy reaches out to him and touches him and says that to him before he heals him. And then Joseph’s boy flees to the wilderness. He has to- because the leper’s uncleanness has become his own. And when Joseph’s boy returns from the wilderness he invites himself to dinner. At a tax collector’s house. And it’s when Joseph’s boy is seated around a table, eating and drinking with sinners and tax collectors- people who were considered am-ha-aretz by good Jews- that’s when Joseph’s boy uses the word ‘disciple’ for the very first time. But I can’t help but wonder if maybe Joseph’s boy was the first disciple. I can’t help but wonder if maybe he was an apprentice in more than just carpentry. 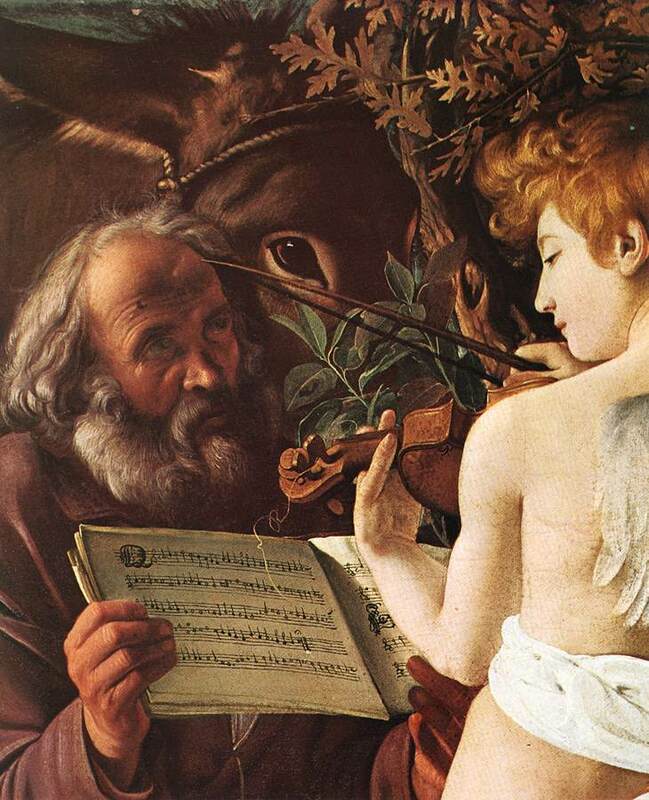 When Joseph’s boy grows up, again and again, he chooses mercy over what the law mandates. He reaches out to women Torah says he should reject. He talks about the spirit of the law and not the letter. He says the law was made for us to thrive; we weren’t made for the law to trip us up. In other words, when he grows up Jesus acts and sounds an awful lot like his father. I don’t know why that should surprise us. We believe that Jesus is fully God. We believe that Jesus is God incarnate. God in the the flesh. 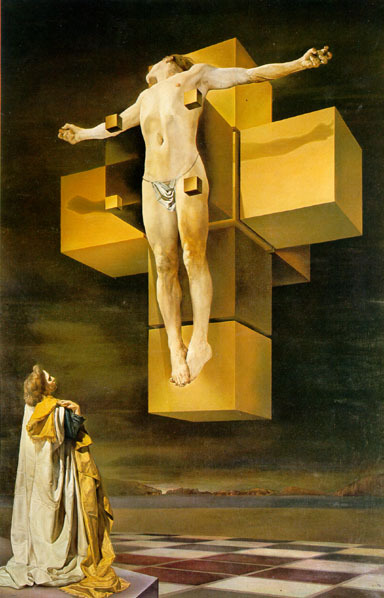 But paradoxically, we also believe Jesus was fully human. As human as you or me. Jesus stank and sweated. He spit up as a baby, and when he sneezed real boogers came out of his actual nose. He didn’t just seem human. He wasn’t God pretending to be human. His humanity was not a disguise hiding divinity underneath. His divinity did not steer his actions or control his thoughts anymore than you or me. He was truly human. As human as you or me. He got tired like we do. He got hungry like we do. He laughed and he wept like we do. He sometimes lost his temper and dropped a curse word like we do (Mark 7). He got constipated and everything else I can’t get away with mentioning in church. He was fully, completely, 100%, no artificiality, nothing missing, no faking it, human. that Jesus needed to be taught. 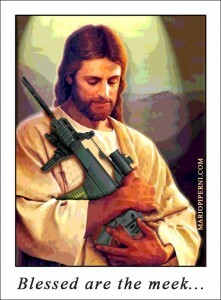 Jesus needed to be taught how to pray. Jesus needed to be formed by the practice of worship. Jesus needed to be nurtured into his faith. Jesus needed to be trained to give and forgive. Jesus needed to be discipled in what it means to follow God before he ever called his disciples to follow him. We believe that Jesus was truly human, as the creed says. You see, Jesus taught what he taught not because it was a satellite broadcast from our Father in heaven. No, Jesus taught what he taught because that’s what his father and mother taught him. And that’s the something about Joseph that always makes me think of my boys. Because if Jesus couldn’t be Jesus without his father, then my boys can’t possibly ever be like Jesus without theirs. Without me. Without you. Without their mother. Without a community like this one. 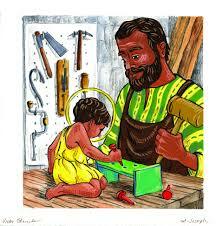 Jesus needed to be apprenticed into the faithful person he became. 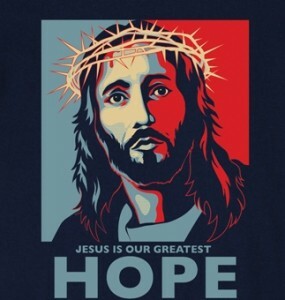 If Jesus wasn’t Jesus all by himself, then it’s ridiculous to think that we can be like Jesus all alone by ourselves. That’s why we do what we do here. Teaching the stories. Offering bread and wine. Baptizing with water. Serving the poor. Praying the prayer he taught us- which I’ll bet sounds just like the prayer his father taught him. And that’s the reason we’re starting another faith community in Kingstowne. Because if Jesus needed to be discipled before he could deliver the Sermon on the Mount, then we need to be discipled before we can live it. And we can, you know. then the life of Christ isn’t just an impossible ideal we admire once a week. It’s a life we can make our own. Because if its true that Jesus was fully human, as human as you or me, then the logic of the incarnation works the other way too. If Jesus was as fully human as you or me, then you and I can become as fully human as him. If Jesus was fully human, then you and I become as fully human, as fully alive, as him. It’s not just that Jesus got tired like we do, got hungry like we do, laughed and wept like we do. No, if the incarnation is true, then we can forgive like he did. We can serve and bless and welcome like he did. We can receive those whom others would reject like he did. Like him, we can turn the other cheek. Like him, we can love our enemies. Like him, we can give our selves to an upside Kingdom. And like him, we can live such beautiful lives that God can’t help but to raise us from the dead. But just like him we can’t do it by ourselves. 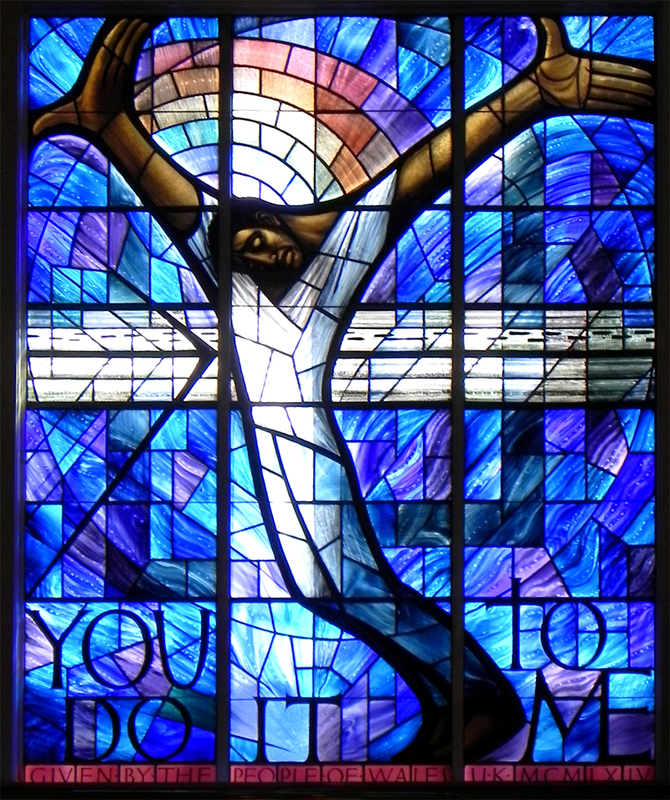 Here’s a sermon of mine on the cross that Scot McKnight posted at the Jesus Creed blog. Mirash in the Moment: Why Did Jesus Come When He Did? 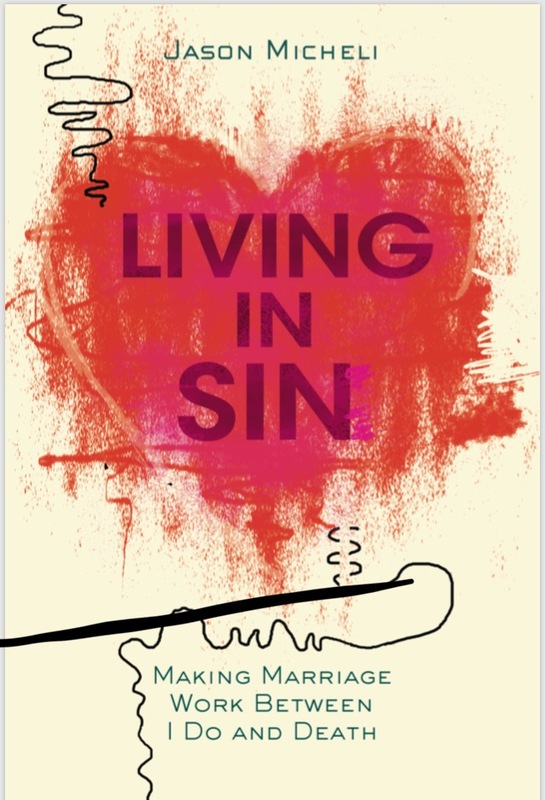 As promised, this week I’m going to try to answer the questions that didn’t get pulled in this weekend’s bingo sermon questions, Midrash in the Moment. Here’s Jeff’s question: Why did Jesus come when he did? As opposed to some other point in history? That’s a million dollar question. That’s also impossible to answer. I even asked Scot McKnight for a hint and he couldn’t do much better than I’ve got below. At least from a God’s-eye perspective. Scripture says God sent Jesus ‘in the fullness of time’ which suggests there was something auspicious about when Jesus came. We can’t really know why from God’s perspective. What we can do is answer from a human perspective, from scripture’s point of view. At least as far as the scripture writers’ understood it, God sends Jesus when he does because the oppression and idolatry of Rome had gotten to a point that necessitated or provoked the incarnation. God heard his people’s cries, in other words. That’s why Matthew tells his Gospel in a way that makes explicit that Caesar is a new Pharaoh and Rome is the New Egypt. 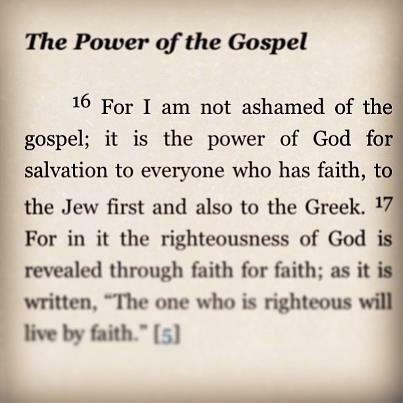 And Matthew’s Gospel begins with a ‘genesis’ just like the Hebrew story begins. That’s Matthew tells you that Herod kills all the new born sons just like Pharaoh did. That’s why Matthew has Jesus’ life beginning in Egypt just like Moses’ did. All the language in Luke’s Christmas story, that we don’t even think about, is loaded with double-meanings meant to show how Christ is God’s alternative to Caesar. In the ancient world, Caesar’s rise to the throne was referred to as the Advent of a Golden Age. He was worshipped as a god. What do the angels say to the shepherds when Christ is born? Yep, same thing but this time they’re referring to a baby in diapers and not a Caesar in, well, diapers. From the Gospels’ perspective, then, Jesus is born to deliver Israel from Rome just as Moses did from Egypt. It’s how Jesus delivers that is unexpected. 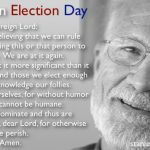 In Postings	Advent, Advent Conspiracy, Caesar, Incarnation, Jesus, Jesus Creed, Nativity, Questions about Christmas, Reclaim Christmas, Scot McKnight, Why did Jesus come? United Methodists are technically a tee-totaling tradition. It’s our heritage, and in some ways I think it’s a missional hurdle. You can blame prohibition largely on the United Methodist Women- just ask Ken Burns- and you can blame Mr Welch of juice fame (a Methodist) for why we have to imbibe that terrible syrup during the Passover of Our Lord. Of course, racism and slavery are also a part of at least one half of our heritage so preserving the past isn’t necessarily all pearls. Which is to say, I home brewed beer as a student in seminary before it was trendy or hip to home brew (or home brew as a seminary student). 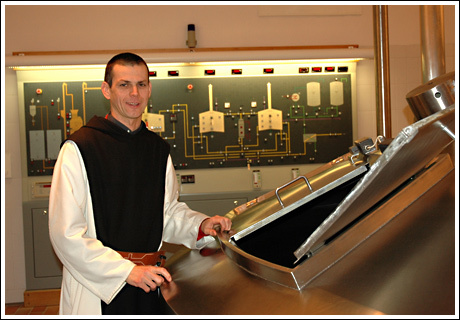 It made me feel monkish.And, no, I didn’t tell the ordination committee about that hobby. All in all, my yield tasted pretty good, excepting one flavor that was called ‘Englishman’s Nut Ale’ which tasted like, well, an Englishman’s nuts. Ten pounds later, however, I turned in the towel for other hobbies. 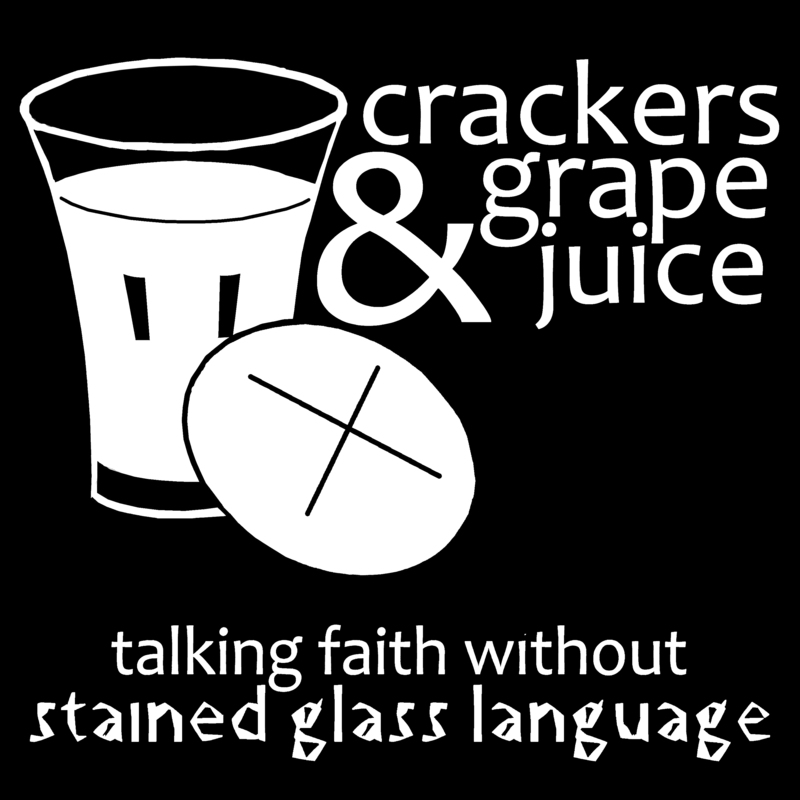 Jeff Cook, via Scot McKnight’s Jesus Creed blog, has a great post, merging cerveza and the ontological argument for the existence of the/an Almighty. Beers that exist are greater than beers that do not exist, and as such existence is a great-making property. If God exists, God is the greatest conceivable being. Let’s assume the greatest conceivable being does not exist. If (3) than there is something greater than the greatest conceivable being. (4) is a contradiction, so (3) is false. God exists and we know this because of great beers. Contrary to Kant, every philosopher I know believes that beers that exist are greater than beers that do not exist. It would be offensive to humanity, the Rolling Stones, and your grandmother to deny Premise 1.